Every time you buy a Wild Touch® product, you make your personal contribution in supporting the worlds wildlife. Wild Touch® Foundation mission is to support and protect our world’s wildlife. For each product sold Wild Touch® donates 2 EURO to wildlife protection projects all over the world. In the 20th century, wildlife all over the world are facing an escalating pressure from a growing human population and its effects, from habitat destruction to spread of disease, illegal wildlife trading and overhunting. The Board of Directors in the Wild Touch® Wildlife Foundation´s will every year decide which projects we are supporting. Our contribution to support the world’s wildlife is not limited to any geographical focus, specific species or specific type of wildlife protection projects. Educate individuals, politicians and organizations about the fact that legal and controlled hunting is one of the most effective ways to ensure a rich and strong population of wildlife. Widespread information nowadays about the endangered status of many prominent species, such as the tiger and elephants, might make the need for such a convention seem obvious. But at the time when the ideas for CITES were first formed, in the 1960s, international discussion of the regulation of wildlife trade for conservation purposes was something relatively new. With hindsight, the need for CITES is clear. Annually, international wildlife trade is estimated to be worth billions of dollars and to include hundreds of millions of plant and animal specimens. The trade is diverse, ranging from live animals and plants to a vast array of wildlife products derived from them, including food products, exotic leather goods, wooden musical instruments, timber, tourist curios and medicines. Levels of exploitation of some animal and plant species are high and the trade in them, together with other factors, such as habitat loss, is capable of heavily depleting their populations and even bringing some species close to extinction. Many wildlife species in trade are not endangered, but the existence of an agreement to ensure the sustainability of the trade is important in order to safeguard these resources for the future. 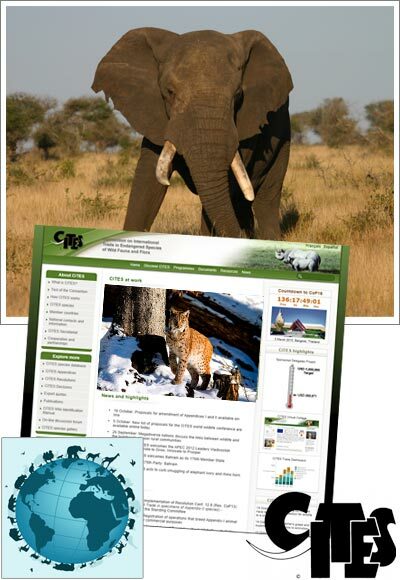 CITES was drafted as a result of a resolution adopted in 1963 at a meeting of members of IUCN (The World Conservation Union). The text of the Convention was finally agreed at a meeting of representatives of 80 countries in Washington DC., United States of America, on 3 March 1973, and on 1 July 1975 CITES entered in force. The original of the Convention was deposited with the Depositary Government in the Chinese, English, French, Russian and Spanish languages, each version being equally authentic.